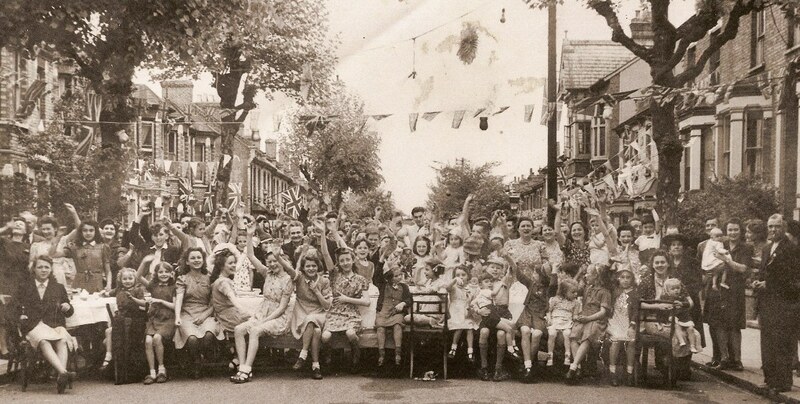 Sandra Graves has provided this photo which shows celebrations of VE Day (May 1945). It includes the following people: John (Jack) Payne, Ann and Colin Keeping, Mrs Martin, David Martin, Mary McCarthy, Mrs Foster, Mrs Russell with her daughters, Wendy Biggs, Pat Digby, Sheila Eldon, Royston Foster. Half way along the front row a small girl is sitting sideways on the chair: that is Jean Bartholomew. Mrs Pauline Latarche adds 'Mary Latarche is in the back-row fourth from the left'. Wendy Todd (nee Biggs) adds '... as well as Brenda and myself and others mentioned in the caption, I recognised Pat Digby and Sheila Owden. (Pat is front extreme left and Sheila is six along from her.) They lived next door to each other across the road from Brenda. (I think the Sheila Eldon listed is the Sheila Owden I remember!) She married but I can't remember her married name. I know Brenda often did some baby sitting for her as Sheila and her husband lived with Mr. & Mrs. Owden for quite a while. It also looks rather like my little Grandma Williams standing, with the hat, fifth from the right. She lived in Chiswick though, so unless she was visiting for the day, I can't be absolutely sure it is her! These are other names I can remember who may or may not be in the photo. or mentioned in the caption. Rita Keyes & Margaret Kelly (who were good friends), Ann Randall (who married Maynard Martin), Raymond Wright, Ray Maslin (who lived next door to Georgina & Colin Keeping for a while), John Eborn and Susan & Virginia Nash (both families lived next door to us) and Roy Blackwell who lived next door to them. Also Ray Dorey (whose father ran Dorey's the builders) whom Kath once counted amongst her many boyfriends! Christabelle Beazley (who lived next door to Brenda). I believe Rita Wiltshire also lived in the road. Reni Jones (real name Verena Poshofer) plus her brother Manfred and their family lived for a while in the 'big house' which I understood to be a lodging house. Also of course, there was Dave Marshall, who ended up living in Australia! Then there was Mr. & Mrs. Ward who ran the Post Office and had a son and daughter - Jean and Graham? Jean married and also lived in our road. She had a boy and a girl who attended St. Paul's School when Mum was the secretary there. There were also the corner shops, one I remember was called Woolgar's and another was Cottles and there was the bootmenders, but I can't remember the name. The Parker family, I think, lived with the Woolgar's for a while, I believe they were related. They had a teenagers, a girl who was possibly called Margaret and a boy whose name escapes me. The 1935 OS Map shows Hamilton Road ran off Windmill Road in an east by north east direction: the properties on the northern side backed on to the railway and those on the southern side backed on to Clifden Road, which was built up later. The properties were mainly larger than average terraces with a few semi-detached houses. All had a small front garden and larger back garden. If you recognise anyone in the crowd please get in touch.